A body is discovered on the other side of the Atlantic with startling similarities to the Ragdoll murders. DCI Emily Baxter is called upon to investigate with FBI Agent Elliot Curtis and Damien Rouche of the CIA. The body has been strung up and the word 'BAIT' carved into its chest. As the investigation intensifies, another body is found, also carved with 'BAIT'. The nearby corpse of the killer is carved with 'PUPPET'. 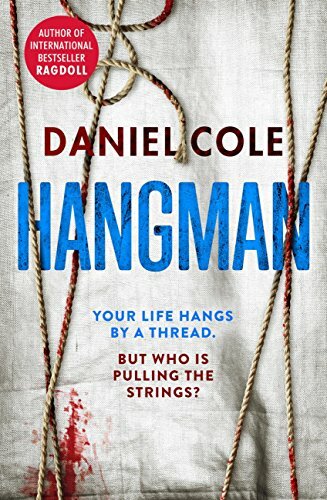 Baxter, Curtis and Rouche must work out how the victims are selected and just who the puppeteer is; the person pulling the strings. This book was an incredible read. I really didn't think it would come anywhere close to its predecessor, Ragdoll, but how wrong was I! The characters were brought to life with such outstanding clarity that they literally leapt off every page. DCI Baxter was one tough lady who, despite trust issues and many faults, was sassy, loyal and dedicated to her job above and beyond the call of duty. I thought the entire book was imaginative, creative and original from beginning to end. It was gritty, brutal, gory, real and pumping with adrenaline. The imagery and ingenuity was fantastic - the excellent scene inside the church is one that will stay with me for a very long time. I'd love to say this book would make a fantastic movie but more often than not, movies disappoint. Let me put it bluntly - the book did not. If you get the opportunity to read Hangman, grab it with both hands! I enjoyed it so much I could burst with pleasure 😊.